Millions of people flock to convenience and grocery stores every day to purchase a chance to win it big in the lottery. It’s nice to think that if you won the lottery all of your problems would be over, but for some people that is simply not the case. 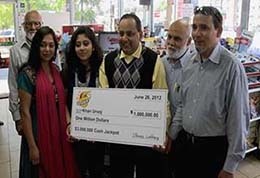 In 2012 Urooj Khan purchased his winning million dollar lottery ticket at a 7-11. Rather than wait for installment payments, he decided to take a lump sum of $425,000. The day after the check was issued, Khan was pronounced dead. Originally the authorities didn’t suspect any foul play, but according to the autopsy, Khan had been poisoned with cyanide. His check was later cashed by his estate and, to date, no arrest has been made for his murder. If that story doesn't give you chills, then consider this one. Ibi Roncaioli of Ontario was the winner of a 5 million dollar jackpot. Roncaioli secretly sent money to a child she'd had with another man and when her husband, Joseph, found out, he killed her. Joseph was ultimately convicted of manslaughter for poisoning his wife. While murder is certainly a horror story, there are some that are simply just sad. Andrew Jack Whitaker was already a millionaire when he purchased his lottery ticket, winning an astounding $315 million dollar Power Ball. Can you imagine $315 million dollars. But Whitaker’s life took a turn for the worse after he claimed his winning jackpot. A series of legal and personal problems hounded Whitaker, who unfortunately turned to alcohol for escape. Were those things not enough, personal tragedy struck with the death of his granddaughter in 2002 from a drug overdose. Five short years later, his daughter passed away as well. "I wish I’d torn that ticket up," he cried to reporter's after his daughter's death. Billy Bob Harrell, Jr. might have been wishing the very same thing prior to his death in 1997. Harrell Jr. won a massive 31 million dollar lottery and, reputedly, did not have a problem spending it. He bought a ranch, multiple lavish houses and expensive cars, but lady luck ultimately turned her back on him. Harrell, Jr. later divorced and committed suicide. Lottery money can buy a lot of things, but as evidenced with these stories, eternal good fortune and a life with no tragedy certainly aren't on that list.